A workshop with Lee Klinger promotes fire-mimicking techniques to help oak trees survive, without burning a thing. In workshops offered recently by Hidden Villa, ecologist Lee Klinger demonstrated ways to prevent Sudden Oak Death. If you’ve driven through our hills and noticed whole oaks turned brown and dead, you may be looking at an example of this blight on our oak trees. Klinger’s method mimics the effects of forest fires. His theory is that oaks are fire-adapted and thus need periodic fires to remain healthy. “Fire replenishes minerals, removes competition and reduces sources of acidity such as mosses and lichens.” With Sudden Oak Death, the plant pathogen, Phytophthora ramorum, attacks the trees through the trunks. To mimic the effects of forest fires, he recommends cutting back underbrush that crowds the tree, removing mosses and lichens from the trunk of the oaks, spraying the tree trunk with lime, adding minerals to the soil and topping with compost and mulch. Klinger heads an organization called Sudden Oak Life, which promotes a soil-replenishing method to promote healthy, natural forest conditions. 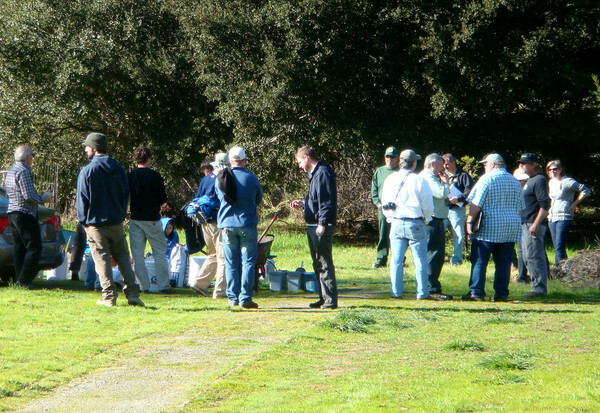 Many local arborists and land managers attended the first workshop; the second workshop was for nonprofessionals. I watched Klinger demonstrate his method on a big, old oak tree at Hidden Villa. First he used loppers to cut back underbrush that was crowding the tree. Then he used a gallon-sized scoop to take minerals out of a bucket and spread them under the tree, advising workshop participants to keep looking up to see that they were covering beyond the drip line (the outer-most edges of the tree). He said that the roots often extend beyond the drip line. Then he used a hand-pump sprayer to thoroughly coat the tree trunk (as high as he could reach with the sprayer) with a mixture of hydrated lime, sea salt and milk—making sure to get into all the cracks in the trunk bark. He used a wheelbarrow to mix the minerals: azomite, oyster shell calcium, and rock phosphate. For a very large tree, shoveling these minerals from the wheelbarrow is an alternative to using buckets and scoops. Klinger recommended watering deeply after spreading the minerals, rather than digging the minerals into the ground. After the minerals, for one big tree, he adds a cubic yard of manure-compost and then covers that with two or three cubic yards of mulch. He also adds compost tea. It seems to me that Klinger’s method is an organic, sustainable, ecologically sound way of preserving our native ancient giant beautiful oak trees. 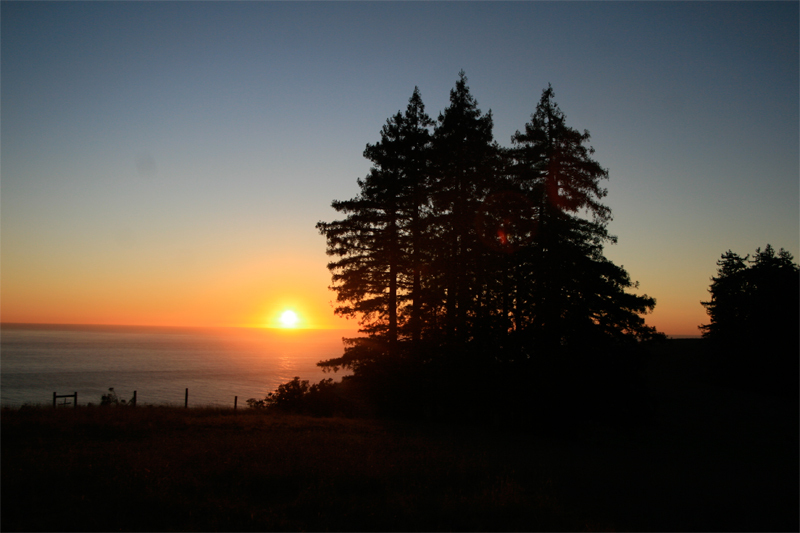 About This Column: Each week Pam Walatka will explore life in Los Altos Hills. Pam has lived in Los Altos Hills since 1978 and has been gardening organically and sustainably since 1968. Contact Pam at pamwalatka@yahoo.com or visit pamwalatka.com.